There is substantial concern that pollution from livestock on rangelands degrades water quality, threatening human and environmental health. For the past 25 years, the Rangeland Watershed Program (RWP)—a diverse partnership of rangeland stakeholders—has developed and implemented an integrated research, education, and planning program to proactively address this concern. Active partners include ranchers, the University of California, USDA Natural Resources Conservation Service, resource conservation districts, Board of Forestry and Fire Protection’s Range Management Advisory Committee, conservation groups, and Regional Water Boards were founding partners of this process. The initial outcome of the RWP partnership was California’s Rangeland Water Quality Management Plan (CRWQMP). The Plan outlines science-based management strategies to prevent water quality impairments, and provides for educational programs to develop on-ranch water quality protection strategies. As a result, the Ranch Water Quality Management Planning Short Course was developed to provide comprehensive guidance and support for ranchers to develop on-ranch water quality plans. The Short Course and resulting ranch plans have been used to comply with State and Federal regulations, and have been successfully adapted to keep pace with a changing regulatory environment. In California, the State Water Resources Control Board (SWRCB) and nine Regional Water Quality Control Boards (RWQCB; Fig. 1) are responsible for developing and implementing nonpoint source (NPS) pollution control policies to protect the State’s water resources. Nonpoint source pollution enters waterways as runoff from diffuse, distributed sources across the landscape. Following the Federal Clean Water Act (CWA), water bodies found to contain excessive pollutant levels are listed as impaired (CWA Sec.303(d)); and watershed activities are then subject to special regulations. Grazing on California’s public and private rangelands is considered a potential source of pollutants, and is listed as a potential contributor to approximately 0.9% of all impairments in the State (Fig. 1). Due to the diversity of California’s rangelands and ranching operations, it is extremely difficult to identify successful one-size-fits-all, state-wide regulatory actions to achieve desired local water quality goals. A founding principle of CRWQMP is that flexibility for adaptation to site-specific conditions, challenges, and opportunities is central to successful water quality enhancement and protection. The emphasis on local conditions sets the program up for success across a range of ecological contexts in a way that state-wide policies cannot. When considering new grazing regulatory actions, policymakers should build upon the existing collaborative approach of the RWP. 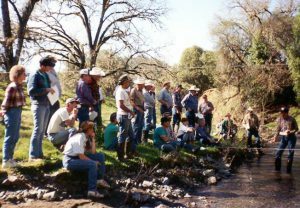 Shortcourse: The flagship educational program of the Rangeland Watershed Program (RWP) is the Ranch Water Quality Management Planning Short Course, which is designed to address water quality issues related to ranch management in a site specific context. It has been used to successfully provide compliance with NPS regulations across the State. Via the Short Course, ranchers develop ranch and watershed strategies to 1) determine impairments to beneficial uses (e.g., drinking) of water bodies in the ranch’s watershed, 2) assess causes of the impairments, and 3) develop and implement ranch water quality plans using tested practices (Table 1) to address causes of impairments. The overall RWP educational approach is built upon a foundation of science and on-the-ground experience. A substantial body of research has been conducted across California to support Short Course curriculum and ranch management. For example, research has documented efficacy of practices (Table 1) to protect and enhance water resources (George et al. 2011). Basic and applied research on microbial, nutrient, and sediment pollutants has greatly increased our understanding of actual grazing-related impairments (Fig. 1; Roche et al. 2013). >80 short courses conducted in 35 counties with >1000 ranching community members (Fig. 2). >2 million acres of rangeland placed under water quality plans. 2009-2014: >$300 million in USDA cost sharing for rangeland water quality practice implementation. Western Extension Directors’ Award of Excellence (2012) for the Short Course. Increased rancher capabilities and engagement in water quality research, policy, and management. Due to its success, the Short Course has served as a model for other efforts across the State, including the Central Coast Farm Water Quality Program. This approach demonstrates how collaborative teaching, outreach, and research can successfully engage and resolve controversial public policy issues—and should serve as a starting point for shaping future grazing lands water quality regulations. California’s Rangeland Water Quality Management Plan: An Update. Melvin George, Stephanie Larson-Praplan, et. al. Rangelands: 33:20-24, 2011. A Scientific Assessment of the Effectiveness of Riparian Management Practices. Melvin George, Randy Jackson, et. al. In: Conservation Benefits of Rangeland Practices. Lawrence, KS. Allen Press, 2011. Water quality conditions associated with cattle grazing and recreation on national forest lands. Leslie Roche, Lea Kromschroeder, et al. PLOS ONE 8: e68127, 2013.